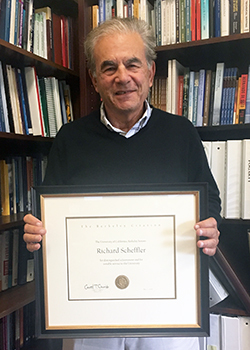 On May 1, Professor Richard M. Scheffler was awarded the Berkeley Citation, among the highest honors the campus bestows on its community. 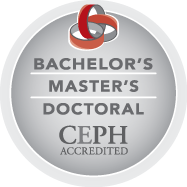 The award was presented by School of Public Health Dean Emeritus Stephen M. Shortell during the Health Policy and Management Division faculty meeting. Professor Scheffler joined the Berkeley faculty in 1981. He is holds the Distinguished Chair in Health Economics and Public Policy, a joint endowed chair of the School of Public Health and Goldman School of Public Policy. The citation recognizes his 36 years of service to the Berkeley campus that have gone far beyond the call of duty. Professor Scheffler's contributions include founding the Health Policy PhD program at the School of Public Health in 1988 and serving as the program's director for a decade, founding the joint Masters of Public Health-Masters of Public Policy Program in 1986, and serving as president of the Berkeley Faculty Association. He was also recognized for his service as the founding director of the UC Berkeley/UCSF Robert Wood Johnson Foundation Health Policy Scholars program from 1993-2005. The interdisciplinary, campus-wide program had 81 graduates over its lifespan, with a number of those graduates now on the Berkeley faculty. “If there is one word that sums up Richard's contributions, it is 'builder.' Many faculty and students alike have benefited from his leadership,” said Dean Emeritus Shortell. Professor Scheffler is retiring from teaching in June, but plans to remain an active member of the UC Berkeley community. He will devote his time to his research at the Nicholas C. Petris Center on Health Care Markets and Consumer Welfare, and was just elected to serve as a member of the Berkeley Academic Senate's Divisional Council for the 2018-2019 academic year. With your energy, professional interest, and wisdom, I am sure you are not going to retire," wrote Professor Emeritus Teh-Wei Hu. "In fact, I predict that you will actually be much busier."